WHITPAIN TWP., Pa. (WPVI) -- A man found dead after a fire in Montgomery County actually died of stab wounds, investigators said Friday. The body of Won Woo Do, 56, was discovered inside a bedroom of the home on Township Line Road near Butler Pike in the Blue Bell section of Whitpain Township early Thursday morning. Firefighters arrived at the home shortly after 2:10 a.m. to find a ranch-style home engulfed in flames. Do's body was found after the flames were extinguished. 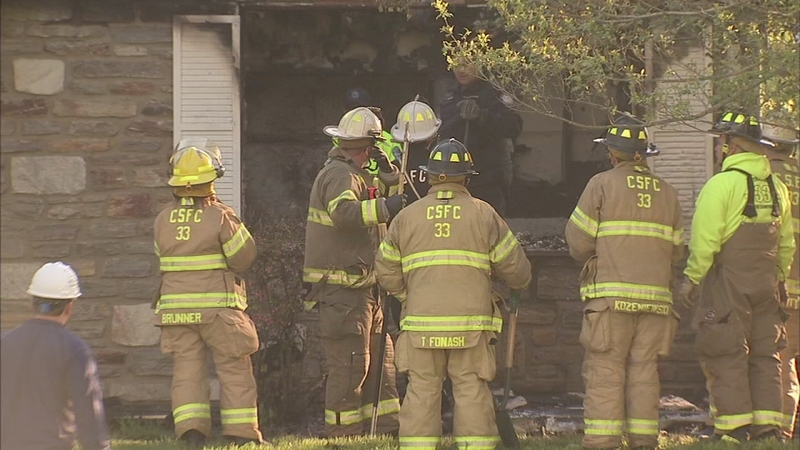 Fatal house fire in Whitpain Twp. : Matt O'Donnell reports during Action News at 6 a.m. on May 4, 2017. According to the district attorney's office, an autopsy revealed he died of multiple stab wounds, and his death has been ruled a homicide. Do was the only person home at the time of the fire, investigators said. Four people lived in the home, police say, but the other three were out for the night. Anyone with information is asked contact the Whitpain Township Police Department at(610) 279-9033 or Montgomery County Detective Bureau at(610) 278-3368.